At least 40 people have been killed, hundreds wounded, and thousands detained in more than three weeks of uprisings in Ethiopia’s Oromia state, the largest of nine linguistic-based states. The Oromo people make up close to 50 percent of Ethiopia’s population of 100 million. Protesters primarily oppose a draft master plan that, if implemented, will expand the jurisdiction of Ethiopia’s capital, Addis Ababa, into Oromia. Dozens were killed last year in similar protests when authorities first introduced the controversial Addis Ababa and Surrounding Oromia Special Zone Development Plan or the Master Plan. The ongoing protests began last month in Ginci, a small town about 50 miles west of Addis Ababa. There, the demands were limited and benign largely centering on the ownership transfer of a local stadium and the clearing of nearby forest for development by foreign investors. The master plan formed only one piece of their demands. As usual, the authorities responded using disproportionate force—triggering a widespread outrage. Following the protests, all public schools in Oromia have been closed. Roadblocks have brought traffic in and out of many towns to a standstill. The central government had assumed emergency powers, setting up a command post and instituting curfews in several towns. Where the security situation has deteriorated, notably in parts of Central Oromia, locals have resorted to self-defense. Beyond contentions over the master plan, the ongoing protests, whose scope and scale parallel the revolution of 1974 that toppled Africa’s longest-serving monarch, the late emperor Haile Selassie, have brought to the fore Ethiopia’s longstanding political cleavages. 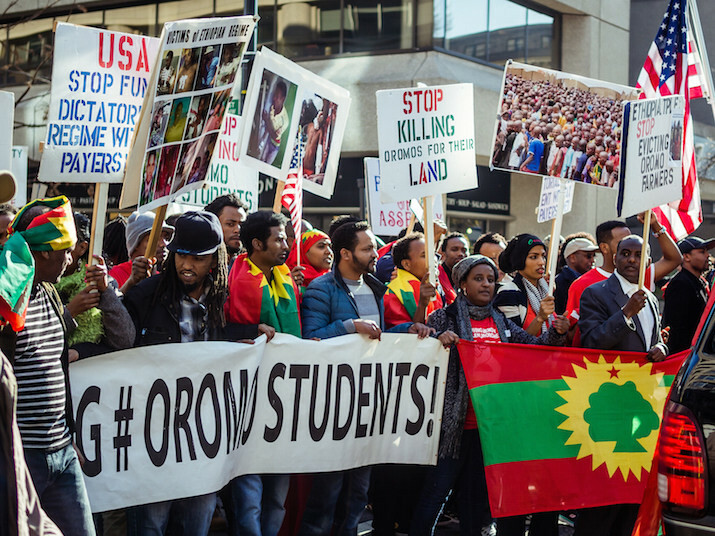 Despite their numerical majority, the Oromo have long complained about dispossession and continued marginalization. Oromo dissent is often equated with terrorism or treason. There is no level playing field for a viable opposition to emerge, let alone thrive. Almost all Oromo cultural and civil society organizations are banned. Courts are not independent. Young people, Oromos, and others, increasingly feel left out of key decisions that affect their future and lack avenues to air their grievances. Youth unemployment is acute. Employment in the public sector, the leading employer in the country after agriculture, requires party membership or deep connection to the ruling elite. Fleeing to Europe is proving treacherous. The uprising spread quickly, reaching all corners of Oromia, more than 130 towns, according to some reports, in a matter of weeks. State media-monopoly, power blackouts and disruption of Internet communication have not prevented gruesome images of protesters wounded, or killed by security forces from being posted on social media—fueling the revolutionary fervor. In many places, parents and the townsfolk have joined students. The local militia and police in some districts have, in a sign of further escalation, broken ranks with the government and defended protesters against a brutal onslaught by federal riot police and the army. Heavily armed security forces can be seen firing tear gas and live bullets at crowds and patrolling streets in military convoys. Oromo opposition and eyewitness accounts, including video and images shared on social media, show the bullet-ridden, gashed and bloodied bodies of unarmed protesters. Protesters have stretched the security forces thin by employing elaborate nonviolent resistance tactics, including sit-ins, food boycotts, walkouts from classes and gestures similar to the ‘hands-up-don’t-shoot’ used by the Black Lives Matter movement in the United States. In apparent damage containment, the government has paraded several officials before television cameras. However, rather than calming the rising upheaval, their statements are sowing more confusion. On Friday, the regional president, Muktar Kadir, indicated that the controversial master plan, which triggered the protests is only a blueprint and that it could be scraped. The federal house speaker, Abba Dula Gamada, going even further, suggested that the plan had already been put on hold as his government was busy with last May’s parliamentary elections and more recently responding to an ongoing drought and famine. Overall, the government’s efforts at de-escalation have been haphazard at best and counterproductive at worst. For example, while Kadir and Gamada noted that the master plan would not be implemented without public consultation or if the public rejects it, the regional police commissioner told journalists that the protesters are misled about the master plan’s true intent and called on the public to support it. Furthermore, the state-run media and supporters of the government are busy drumming up public support for the plan in a true Stalinist fashion. In contravention of assurances by Kadir and Gamada’s that the master plan will be reconsidered, the state-run Oromiyaa TV (OTV) has been doing wall-to-wall coverage of long-promised public discussions on the plan. However, OTV’s coverage of town hall meetings across Oromia is more of a scripted theater than an open forum where opposing viewpoints are entertained. In towns after towns, government agents planted among participants praise the government’s record on development and the expansion of schools, and then launch into almost verbatim denunciations of “diaspora-based anti-peace elements” who are accused of using social media to provoke uninformed young students to advance their political goals. On the contrary, the public is joining the students by erecting barricades and blocking roads to prevent security forces from gunning down unarmed protesters rather than heeding the government’s call. The EPRDF regime faces a trust deficit. The government’s vigorous counter effort to frame the protests as violent is not working, either. Protesters emphasize the grassroots-based, peaceful and constitutional nature of their demands. However, the government in Addis Ababa has accused them of being tools of “anti-peace elements,” including the outlawed Oromo Liberation Front (OLF) and the Ginbot 7. EPRDF often deflects genuine local grievances by blaming opposition groups and its archenemy Eritrea. “The protesters are members and sympathizers of violent opposition groups who are determined to overthrow the constitutional order in Ethiopia by force,” Abiy Berhane, Minister Counselor at the Embassy of Ethiopia in London, told IBTimes last week. Ironically, Berhane’s comments undermine the government’s previous claims of a popular mandate. In May, the EPRDF claimed 100 percent parliamentary seats in the Horn of Africa country’s 5th national elections. In its quarter of a century rule, the EPRDF had boasted of solid and unflinching support among rural and agrarian communities. Berhane’s suggestion that the protesters are “members and sympathizers of violent opposition groups” is a subtle admission that the regime’s claim of monopoly on popular support is at best exaggerated. The depth and breadth and tenacity of the protests show that people are simply fed up with the ruling party’s ceaseless propaganda about development, massive corruption and an ever-growing repression. Supporters of the government contend that the protests resulted from the lack of clarity and transparency over the master plan rather than a deep-seated popular anger. They have accused and threatened the state leaders for dragging their feet and for not sufficiently explaining the benefits of the master plan to the public. True, a year after protests broke out against it and dozens were killed, key details of the master plan are shrouded in mystery. Leaked documents show that it would expand the capital city’s boundary by 20 times its current size, reinforcing the protesters belief that the plan would lead to the eviction of poor farmers, as well as the loss of Oromo culture and identity. But the contentious questions around the status of Addis Ababa are not new. Ethiopia’s constitution stipulates that Oromia’s “special interests” over the city, which doubles as a regional capital, will be respected. However, two decades after its adoption, the EPRDF government has failed to pass a law to implement the special interest clause. The attack on the Oromo elements in the EPRDF coalition show an increasing sign of internal dissension within the party, especially after the death in 2012 of its mercurial leader, Meles Zenawi. Despite these signs however, the ruling party’s tight hold on the security forces remains unchallenged. The military’s top brass is predominantly Tigrean; as is the top leadership of the national security directorates. After riding the barrel of the gun to assume power, Ethiopia’s freedom-fighters-turned-autocrats have not been shy using deadly force to keep it. It is difficult to predict how the current protests will end. Despite the stiff opposition and loss of lives, the regime could still declare “victory” against what it calls “anti-peace elements.” As happening already, thousands of student activists will be hunted down and herded into detention centers. The bodies of the dead will be collected from the morgues and buried unceremoniously. The wounded will continue to live in limbo or die silently. And the public nurses its wounds once more and bids for another time. However, things may not unfold as usual. The more these protests continue in spite of, and perhaps because of, the massive loss of lives, Ethiopia’s vulnerability will become increasingly apparent. These annual rituals of protests and their violent suppression through brute force has depleted state legitimacy and bodes ill for the country’s and the regime’s future. In fact, it is only a matter of time until these popular dissents metastasize into the straw that broke EPRDF’s internal cohesion. The ruling elite may, however narrowly, cling to power. Their hold will not be tenable. As long as the authorities deny any outlets for dissent, Ethiopia will be for long haunted by the specter of more instability. Hassen Hussein, a writer, teaches Management and Leadership at Saint Mary’s University of Minnesota. Mohammed Ademo is a New York-based journalist and founder and editor of OPride.com, a website about Oromo and Ethiopia.